Previously at Annefors, My was recently graduated and moved in next door to her parents to wait for her lover Louise. Even though Louise was still in college, the two dated frequently. My starts off this round alone in her house. She’s waiting for Louise to graduate from Uni and move in with her. Her parents, Simon and Carita drop by for a visit and a game of kicky ball. My is part of the vast Montell family. She's the oldest daughter of the oldest Montell alive, Simon. Her mother's name is Carita. Back at the family farm, her parents live with her little sister Sara and her grown up and recently married brother Marcus. After some kicky balling and after the computer gets fixed, My succeeds in finding a job as a Roadie in the Music career, as she wished for. Her LTW is to become a Rock God. In the evening she gets invited to an outing with Ricky and some other friends. They go to a fancy night club. It’s a miracle that My is let inside in her track suit. She hasn’t had the money to buy any new clothes at all. Louise arrives with a university diploma and some money for example useful for buying a double bed! A bed that immediately is put to good use! While My is at work, Louise chats up her long list of friends. Sooner or later we’re hitting the Popularity IW for her! As a true Popularity sim, Louise wishes for parties all the time. She invites some of the sims that are not her best friends yet, among them her aunt Susanne, and entertains them with some violin tunes. My gets promoted to Studio Musician and brings David Ottomas with her home from work. Louise, who still didn’t find her desired job in Athletics, instead has time to max her musical enthusiasm. 1p! Sunday! The gathering consists of only adults, except Sara, My’s teen sister. Louise’s sister Gerd had babies recently, but they are too small to be invited. Louise belongs to the Berg clan through her mother Ingeborg. Her father's name is Jerry Wern, and he met her mother in college. Or was it high school? Anyway, Louise is child number two, after her sister Gerd who is married and has twins, a boy and a girl. Gerd and Louise have twin brothers, too, Adam and Aron, who are still in college but are both engaged to be married. Nowadays, Louise is changing into her formal wear when she plays the violin. She’s got a really nice dress, j68 could imagine herself in it. Sara is impressed with the performance. The guests are hanging around all day. They sit in the worn-down furniture, eating the worn-down lunch at dinner time. Carita, My’s mother, waits for something to happen with her arms folded. It’s a rare sight in the sims and a very random picture. And we end this update with Louise Wern, still unable to find her desired job in the Athletics career. And her ”sambo” My Montell, promoted to Concert Pianist. I guess that position comes with a different type of uniform. That was an incredibly trashy work uniform for a pianist! 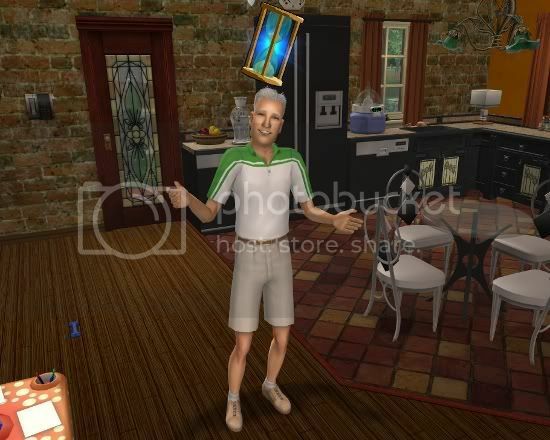 I don't remember my sims having worn something like that - but then, if they did I would probably have tried to forget it. -_- Hopefully she is soon promoted again. Right! I forgot that they don't come home in their new uniform. I suppose it would make more sense in a studio, although I would personally find it kind of embarrassing to see. Seems a small gathering for a Montell family relation, but I suppose you were staying with immediate family only? Better luck next time to Louise with finding her desired job. At least she can wait for it and doesn't have to take whatever's available in the meantime. Hopefully Louise will be able to find her dream job next time. It has become harder and harder to find the correct job for the sims, I feel. It's because there are so many to choose from. I love My and Louise, they are so cute together :) I never noticed how much Louise's profile resembles her father until that pic of her looking for a job on the computer... (I'm pretty sure Jerry has the same face template as Jack Copur). My and Louise are fun together. That work outfit is interesting. I could see it on a dancer, but a musician? Interesting.